Today we get to talk about one of my all time favorites- The Jungle Book. I just watched it and it is every bit as bright and colorful as I remember. 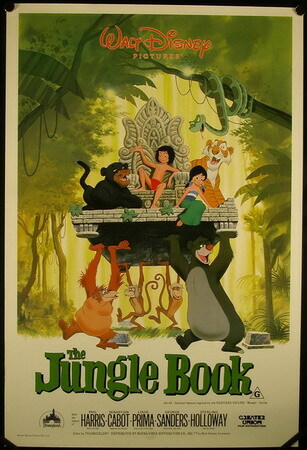 Released in 1967 Jungle Book is the last film Walt Disney produced before his untimely death of lung cancer in 1966. He didn’t get to view the final product but did see some nearly completed drafts. Just a quick bit of trivia. My friend Jim has studied lemurs and monkeys in Madagascar, so I asked him whether there are bears in the jungle. He said not in India. These type of bears are in Vietnam and there are no apes! It’s obviously not a realistic picture but I just thought that was funny. It is interesting to compare Jungle Book to Sword in the Stone, which didn’t work for me. The same xerox method was used but this picture is much more pleasant to watch. If you recall, one of my issues with Sword in the Stone is that everything looked blue and gray. In Jungle Book we get the thick outlines from the sketch xerox style which isn’t my favorite but at least it is light and colorful. But even the brightness wouldn’t save the picture on its own. The sharp writing and the music make it work so well. According to the dvd extras Walt asked the storyboard writers if they had read Rudyard Kipling’s book The Jungle Book. They said ‘no’ and he said ‘good because we are doing it our own way’. I don’t know if as an older man Disney grew weary of the darker themes in Pinocchio, Dumbo and Bambi but the later films of his life are much lighter and comedic in tone . He told the animators to take the dark scenes of the book and ‘turn them on their ear. Have fun with them’. Originally Terry Gilkyson was hired to write the songs but Walt felt they were too dark in tone, so all of the songs except for bare necessities were turned over to the Sherman Brothers. Sherman Brothers had written Mary Poppins and Sword in the Stone for Disney at this point and Jungle Book really shows their versatility. They could easily go from broadway style in Mary Poppins to swing music and jazz for Jungle Book. The idea for the jazz feel came partly from Gilkyson’s song but also from thinking about the monkeys (who are much darker in the book). What do they do all day? They swing! So the king of the monkeys had to also be the king of the swingers. Jungle Book is also the first time in a feature film Disney used ‘celebrity voices’ for it’s characters. Phil Harris was a comic and singer of the era and Walt met him at a party and signed him on to play Baloo. Then we had Sebastian Cabot, Sterling Holloway, Louie Prima and George Sanders. It is the final Disney appearance by the great Verna Felton. I wish they gave an Oscar for best animated vocal. They deserve it and get no recognition. Like Sword in the Stone, Jungle Book is clearly marketed to boys with only 2 female characters- Verna’s matriarch elephant (which is her second time voicing an elephant. First time being in Dumbo), and the girl who gets the water. I really like the watercolor feel to the backgrounds. It reminds me of Dumbo. I am sure Jungle Book was also attractive to Walt Disney because of the popularity of The Jungle Cruise in Disneyland and the easy ties which could be built into the park. What’s strange about this period of Disney is they could produce the animation in half the time but it took longer to make the films. I’m not sure why. Walt’s priorities shifted a bit to the park and his TV show but still it shouldn’t have taken so long with the xerox process? Jungle Book took 4 years to complete but at least it did very well at the box office. 22 million in it’s first release! But really this movie sinks and swims on the strength of it’s songs and writing. The story is very simple. Mowgli is a ‘man cub’ or human who has been raised by wolves. The wolf pack is worried about having a man cub when the great Shere Khan, the tiger, is back prowling around. Bagheera, the panther, agrees to take Mowgli back to the man village for his safety. So, most of the movie is like a road trip (or walking trip) in the jungle with animal characters. 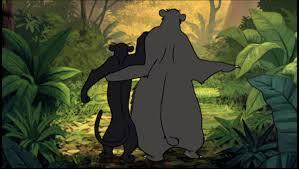 The first characters Mowgli and Bagheera meet on their journey are a band of militarized elephants that are very funny. Next we meet the snake Kaa who likes to hypnotize his victims before the kill. It’s a pretty gnarly character and I like the look of his eyes. It feels hypnotic. Sterling Holloway gives another great vocal performance. He was so versatile as a voice actor. Hard to believe it is the same voice that is so warm and sweet in Winnie the Pooh. Further down the jungle they meet Baloo the bear. He is free-living and easy with just the bare necessities. 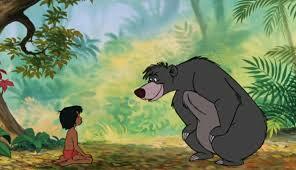 As Baloo explains his life philosophy to Mowgli we get treated one of the best Disney songs ever written. It is so much fun. I dare you not to tap your feet and smile! 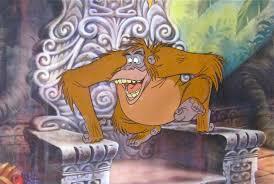 Unfortunately in the middle of the song Mowgli gets taken by some monkeys to their leader, King Louie. They abduct him because Louie wants to find out how humans make fire. In order to charm Mowgli into telling the secret we get another great song. Baloo: You better believe it, and I’m loaded with both. That’s a funny line and so many of the laughs work. It kind of reminds me of a Pixar movie in that regard. The jokes feel natural and part of the plot. Mowgli flees from Bagheera and Baloo and ends up with a band of vultures. They are very funny and clearly based on the British invasion bands of the 60s. Like I said in the Dumbo review I really don’t think this scene is that different than the crows but this is clearly referencing white people not black. Shere Khan voiced by George Sanders coming in at the end is fabulous. What a bass! Then Kaa comes back and sings the longer version of Trust in Me and it is actually Shere Khan that saves Mowgli this time. I love that the gave a snake sinus problems and a lisp. There is something inherently funny about a hissing snake with ssssinus issues. I also like they added two villains. Where the Sword in the Stone had only a few minutes with a villain with confusing motivation, Jungle Book has two villains with clear motivations. They want to eat Mowgli. It’s as simple as that. 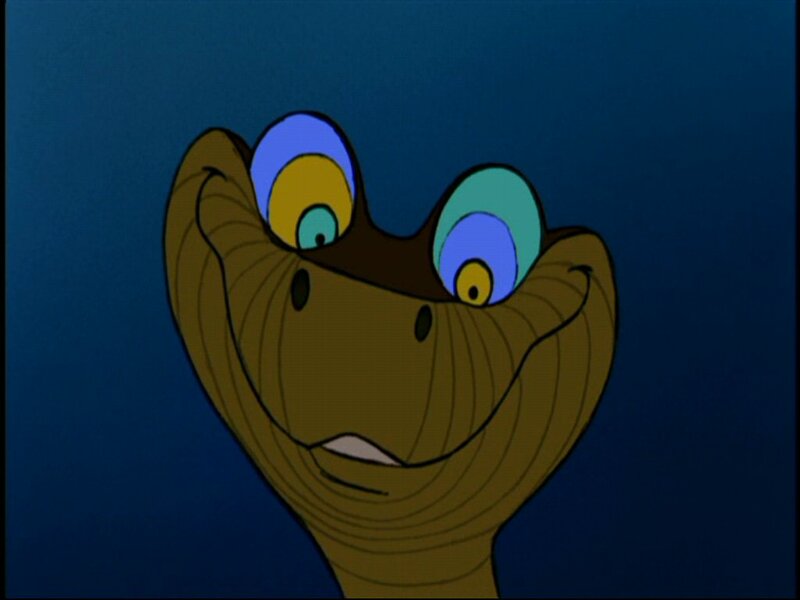 Both Shere Khan and Kaa remind me of good James Bond villains- all sleek and full of vibrato. Baloo then reappears and takes on Shere Khan. For a second we think Baloo is dead in a scene that actually recites scripture but it works, which is surprising in such a silly movie. They’ve had just enough heart with the characters to pull this scene off. 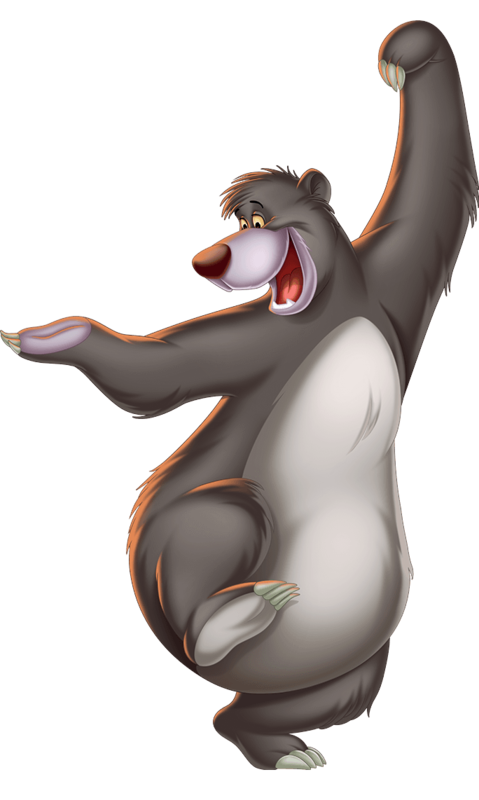 Baloo is also funny when he says ‘I wish my Mother could have heard this…’. That’s good writing! Finally they get the village and Mowgli has the instant love trope which Disney always uses when he see’s a girl getting water . She sings a pretty song but the lyrics I could do without. I like my female characters to have a little bit more free choice in their life. Everything is pretty mapped out for this girl. (It really makes sense that I responded to Little Mermaid so much. There aren’t a lot of strong, good women in Disney films from 1960-1989. Much like Fantasia and its classical music, it is unlikely you will enjoy The Jungle Book, if you don’t like jazz music.. I enjoy jazz music, so I love the movie. The songs make me want to dance! In fact, when I was 14 my Dad took my sister and I to France. We were there on Bastille Day and went to a restaurant with a band playing. To our delight they did a cover of ‘I wanta be like you’. We bought the CD and it was a favorite of our family for many years. It’s just such a happy, fun song. But if it is not your taste you will probably find the movie rough going; although, the characters are a lot of fun and there are 2 great villains. The male-centric messages and characters is a little annoying but I forget about that when I’m immersed in the story. The writing is sharp. Managing to be both tender-hearted and funny. The backgrounds and character animation are the best of the Xerox films with lots of bright colors and movement. 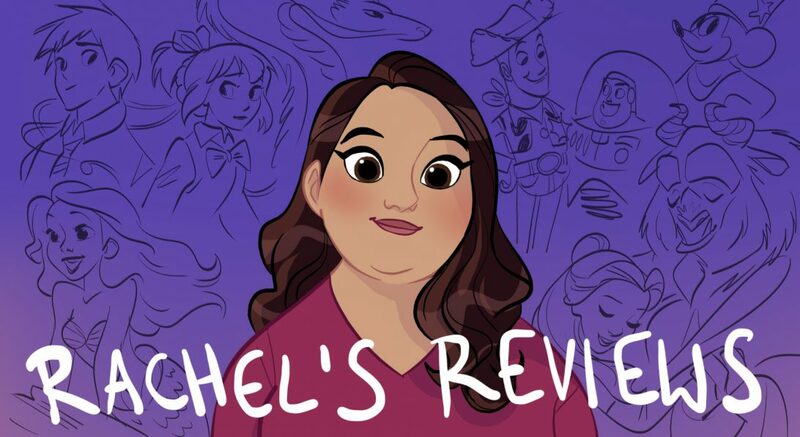 It’s not as artistically interesting to me as their more ambitious projects but just like 101 Dalmatians and Lady in the Tramp, it does what it is trying to do very well, and like I said it all comes down to good writing and music. Jungle Book may be the Disney classic I rewatch the most. It is cheerful, sweet and has a nice message. Plus, it is appropriate for all ages with only one brief sad moment. So check it out! Overall Grade- A (I’d give it an A+ if there was a better female character).